Hidden away and camouflaged in green and orange. 6 bunks with mattresses. Water from river. The fireplace is OK. Photo taken from helicopter landing clearing nearby. The Hector River is worth a side-trip up or downstream. The hut now also boasts a new porch (the iron on which is rusting already), and a wood-burner instead of the cavernous fireplace and chimney down which river-spray used to waft. 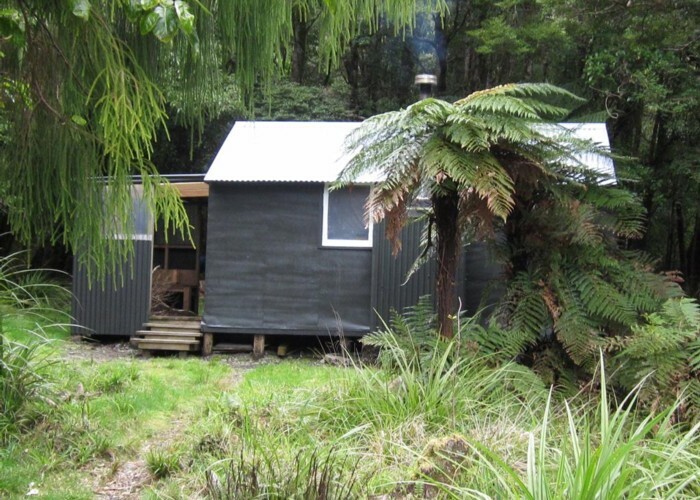 The hut is maintained by the Wairarapa branch of the NZDA. They recently completed a repainting. Some Routes to/from include Over Cone ridge and down to the Cone saddle and out to the Waiohine Gorge road end. About a 5-6 hour tramp. Neill Forks Hut • By Gaiters. Licence: C.
6-7 hours from Tutuwai Hut via Cone. 7 hours from the Mt. Holdsworth road end via Totara Flats and Cone Ridge. 5-6 hours from Waiohine roadend, to Cone saddle, Cone Ridge. 2-3 hours from Maungahuka hut over Consertina Knob. much longer going uphill to M/huka. Added 12 December 2005 by ianfiskianfisk. 5 revisions, most recently 26 July 2014 by TararuaHunterTararuaHunter.